We all have heard by now how devastating concussions can be, and how they can hugely hinder a person’s quality of life if they go untreated. Even it’s a patient’s first concussion, it’s so important to get the proper care and rehabilitation needed, in order to help the brain and body thrive again. We believe that the best approach to concussion rehabilitation requires a community of individuals pulling together as a team: the patient, their doctor, their coach, employers or teachers, and their rehabilitation team. This full roster of community resources can help ensure a full and smooth recovery. The first step in concussion treatment is fully understanding the injury. We use standardized and evidence-based assessment techniques, based on the Canadian Guidelines on Concussion in Sport, and the Guidelines for Concussion and Mild Traumatic Brain Injury, provided by the Ontario Neurotrauma Foundation. In your first appointment post-injury, we’ll try our hardest to get a thorough understanding of your symptoms and history. 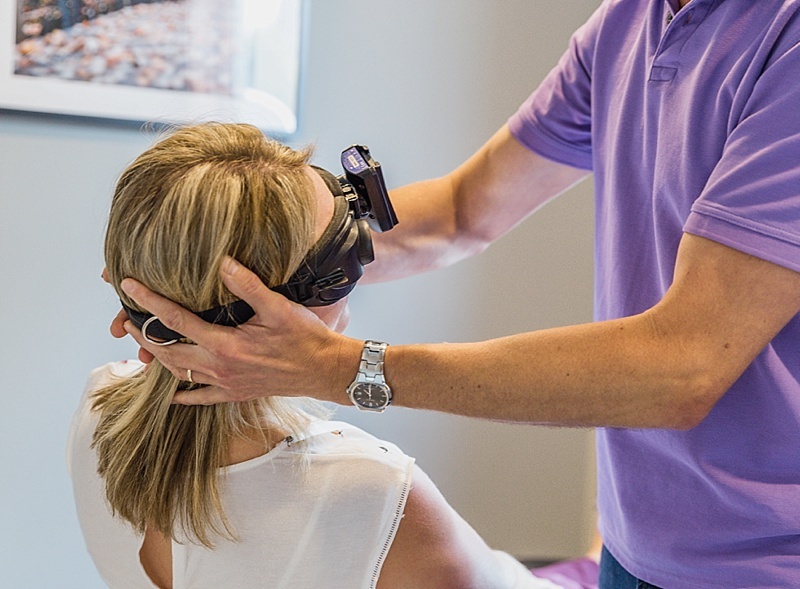 We’ll assess your head, neck, and trunk, and do some vestibular-oculomotor and specific vestibular screening – these have to do with vision, movement, and balance. If necessary, we may also test your heart rate, blood pressure, and neurocognitive state. Our goal is to fully determine your injury and symptoms, so that we can create the most ideal path forward for you. Ryan Sleik, our resident expert on concussions, is thoroughly trained in understanding the various aspects of your injury and how they interact with each other – concussions are incredibly complex injuries! Ryan is the first-ever Level 2 trained therapist in Western Canada through the Shift Concussion Management Program, and is also an instructor with the team at Shift. You can trust you’re in great hands! Additionally, we work with the sophisticated and world-renowned Neurotracker system, which implements the most modern and trustworthy tools for concussion management and assessment. Neurotracker provides us with a 3D visual training device that stimulates the body’s cognitive, vestibular, and visual systems, and helps patients interpret and integrate multiple streams of sensory information. It offers a score, so we can accurately assess where a patient is in their recovery, and whether an athlete is ready to return to their sport with the ability to preform well and avoid further injury. This technology is adaptable to each individual’s level of injury and stage of healing, and is an indispensable tool for those rehabilitating after concussions or mildly traumatic brain injuries. We are proud to work with this well-respected, state-of-the-art modality. In addition to Ryan’s expertise (his background is in vestibular and dizziness disorders, before he moved into advanced concussion treatment), he is also able to clearly and efficiently communicate with other teams and professionals – such as your family doctor, occupational therapist, and counselling services, so that every aspect of your care is looked after. Additionally, other experts on the Creekside team can offer their assistance in your recovery. We work together to provide the most comprehensive care that includes everything you need to feel your best again: acupuncture, Sports Medicine, personal athletic training, kinesiology to help you move more naturally & comfortably, and yoga therapy. We are committed to piecing together the most ideal healing program that’s designed uniquely for you. We offer this comprehensive help for all types of injuries, such as those from sports, motor vehicle accidents, trauma, and slips and falls. We are able to bill extended insurance, ICBC, Worksafe BC, and MSP, based on your qualification. We’re happy to treat you with or without a baseline test, and can interpret any previous baseline information you have. Still have questions? We would be happy to answer them. Get in touch with us.